Stampin’ Up! is celebrating its 25th anniversary all year long, but during the week of the actual date (October 25th to be exact) they thought they should pump up the party even more. So what better way than a sale on the very products that started it all: stamps, of course! Click here to see the complete list of the 25 Stamp sets that are 25% off now through Oct 28, 2013. Cammie loves olives and can eat them straight out of the jar. 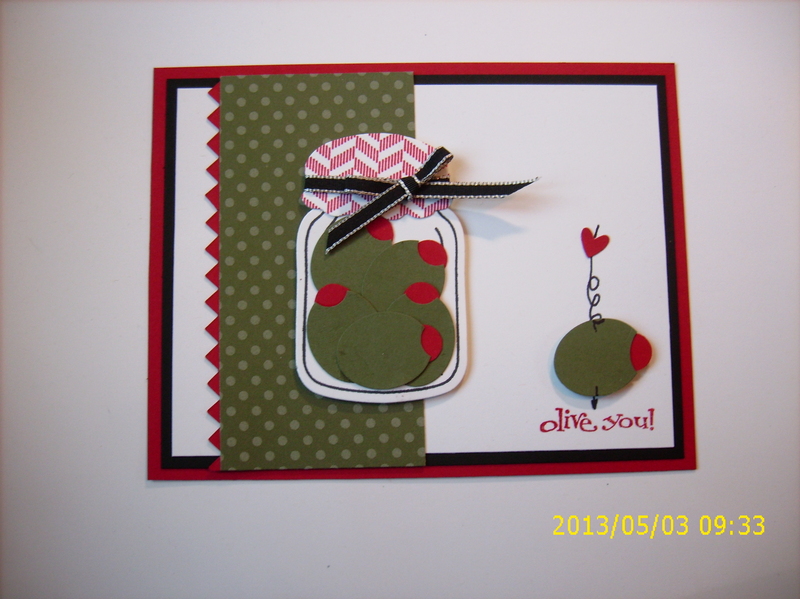 She loves black olives and green olives and today’s card is preserves her olives in a jar! She filled the mason jar stamped from the soon to be retiring Perfectly Preserved stampset and cut it out using the coordinating framelits. The olives were stamped using the Best of Love #132987 stampset and then hand cut to fit in the jar. The lone olive is stamped from the Best of Love stampset. The jar is mounted on a strip of Old Olive Brights Paper stack (retiring on 1 June) and trimmed with the rickrack edge cut from the Tasteful Trim Die#120893. The Best of Series of Stamps are part of an on going year long celebration from Stampin Up. This year Stampin Up is celebrating their 25th anniversary to Each month during 2013, we’ll smash up some of our all-time-faves with a new never-before-seen stamp to create twelve “Best of” stamp sets. The sets are available for the entire year with a new set introduced each month. Check out all the Best of Sets available to date.